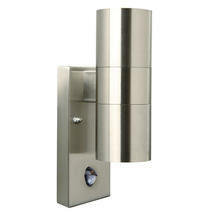 Contemporary PIR lights with urban style. 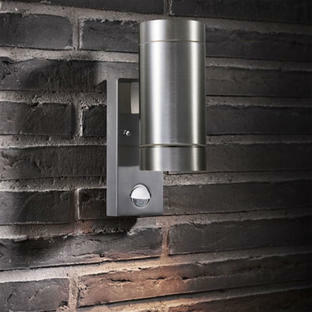 Simple urban PIR security lighting for doorways, walls and entrances. The Tin double wall light casts light both up and down. Available in stainless steel with glass lenses. This wall light contains an adjustable PIR motion sensor. This can be adjusted so that when the sensor is activated, the light turns on for between 10 seconds and 5 minutes. The range of sensitivity for this sensor is 110 degrees. 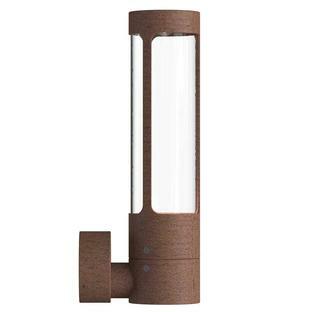 If you like the style of this light but would prefer something larger or would prefer a different finish, the Tin Maxi range of wall lighting with sensor is also available. Maintenance: This stainless steel light must be treated with acid free oil (which is included with the fitting) prior to installation and then repeated 3-4 times a year, this will maintain the finish and longevity of the fitting. 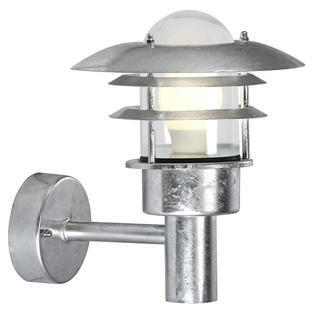 We do not recommend to installing stainless steel lighting in a coastal areas. Also look at our range of sensors here which can turn any light on/off reacting to light an/or movement.